The Tour de France has started, the Commonwealth Games cycling events begin in a couple of weeks, so many of us may be feeling the need for speed, with intentions to dust the cobwebs off our neglected bicycles or ramp it up a gear by attempting a long distance cycle ride. As a chiropractor, I actively encourage my patients to take regular exercise. 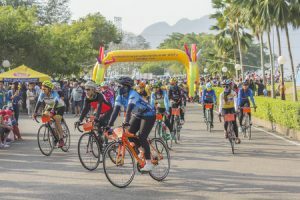 I would also, however, urge cycling fans to prepare appropriately before embarking on a cycle ride, especially if you haven’t ridden a bicycle for several years. Cyclists need to take the necessary precautions or they place themselves at greater risk of injury. Overstretching to reach the handlebars, backwards-sloping seats, wrong seat heights and soft tyres are just some of the factors that can contribute to neck and back pain in cyclists. According to the British Chiropractic Association (BCA), a staggering 73% of cyclists weren’t fitted for their bicycles last year* and one in five (22%) have experienced back or neck pain whilst or as a result of cycling**. It’s great to see more and more people taking up cycling as it’s an excellent way to keep fit. However it’s really important to take the time to ensure you’re sitting comfortably and properly fitted to your bicycle, to avoid injuring your neck or back. For beginners, a hybrid bike is regarded as a good all-rounder because whilst it is not as heavy as a mountain bike, it has thicker tyres than a road bike, making it more stable. The frame of a hybrid bike also allows for a ‘relaxed’ cycling position, which you won’t get with a racing bike, for example. As chiropractors we can always advise you on how to approach cycling safely and tell you what signs to look for if you’re overdoing it. • Don’t strain – make sure you can reach the handlebars comfortably without having to overreach or strain your back, neck, shoulders or wrists. Adjust the height of the handlebars so that you can sit in a more upright position. • Change your posture – Try standing up to cycle at some stages and sitting down at others (but make sure you do this safely!). You might think that you’re limited to one position when cycling but it’s important to try and change your posture. • Seat checker – the seat should be ideally flat or sloping slightly forwards to try and minimise strain on the lower back. Try a variety of saddle shapes to find the one most comfortable for your general, size and cycling position. • Height test – when the pedal is at the bottom, cyclists should be able to sit on the seat with their leg almost straight with only a slight bend at the knee (this should allow maximum pedaling efficiency). • Pump it up – keep tyres pumped up to minimise impact on the spine and consider investing in a floor standing pump. • Keep it loose – make sure clothing isn’t too restrictive and provides cushioning and support where required. • Warm up & cool down – warm up slowly ahead of a cycle and stretch afterwards to help loosen up tight muscles. If you are already experiencing back problems why not make an appointment for an assessment here at Shrewsbury Chiropractic Clinic before taking up cycling or embarking on a long distance cycle ride or race.